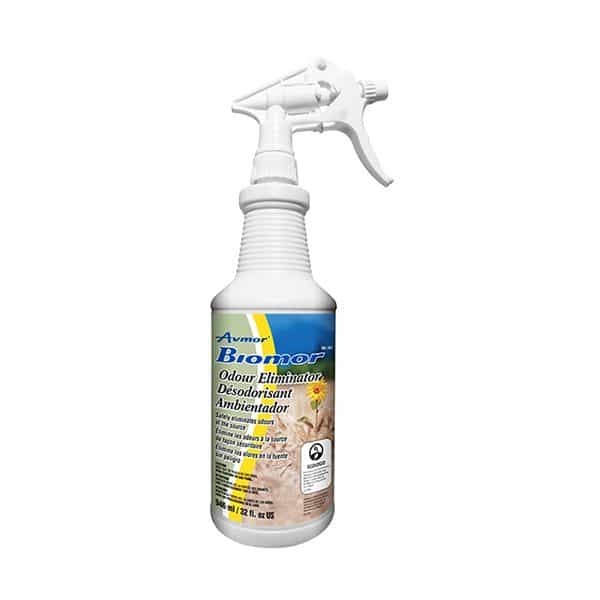 BIOMOR ODOUR ELIMINATOR is a fast acting and effective microbial product that neutralizes odour causing molecules upon contact. To be used on carpets, upholstery, textiles, curtains and other types of fabrics, and in areas such as compost bins, garbage collection areas and gym lockers. It attacks odours such as pet urine, smoke, vomit, perspiration and other unpleasant smells. It can also be used for carpet spot removal and cleaning due to its innovative formulation. SHAKE WELL BEFORE USE. Do not mix the product with sanitizing agents. First test a small inconspicuous area for colourfastness then spray fabric until wet. Spray directly onto surface emitting odour. Do not use as an atomizer and do not use on food contact surfaces. DILUTION: For heavy duty applications, use undiluted. For medium duty applications, use 1:1. For light duty applications, use 1:4. TRANSPORTATION (cars, trucks, buses, trains, airplanes): Used to deodorize fabrics and hard surfaces to control odours caused by food and waste, tobacco smoke, perspiration, vomit, food left over, and urine. HOSPITALITY: To deodorize duvets and pillows, furniture and any surface where there is tobacco smoke, perspiration, dead skin, urine, food waste, vomit and human reproductive fluids. WASHROOMS: To eliminate odours around urinals, toilet bowls, ceilings, floors, and walls. WASTE MANAGEMENT: Controlling odours in and around garbage bins, waste collection vehicles, compactors, garbage chutes (can be manually sprayed or used with an automatic spraying system). SPORTS: Deodorizing of sports wear, gear and locker rooms. MOLD AND MILDEW: To eliminate and reduce stains and odours caused by mold and mildew. FOR CARPET DEODORIZING, SPOT REMOVAL OR UPHOLSTERY CLEANING: Use undiluted. Using a wet sponge, clean area and blot excess moisture with clean towel. Let remainder of moisture air dry naturally. Dilute 1:64 for a carpet extractor to eliminate odours. To increase the performance of the product, it must be used on a regular basis. RECYCLING: This product package including the container and shipping carton are all designed to be recycled. Follow all Federal, Provincial and local regulations regarding waste disposal. Organic ingredients in this product are readily biodegradable in accordance with OECD 301 standard.